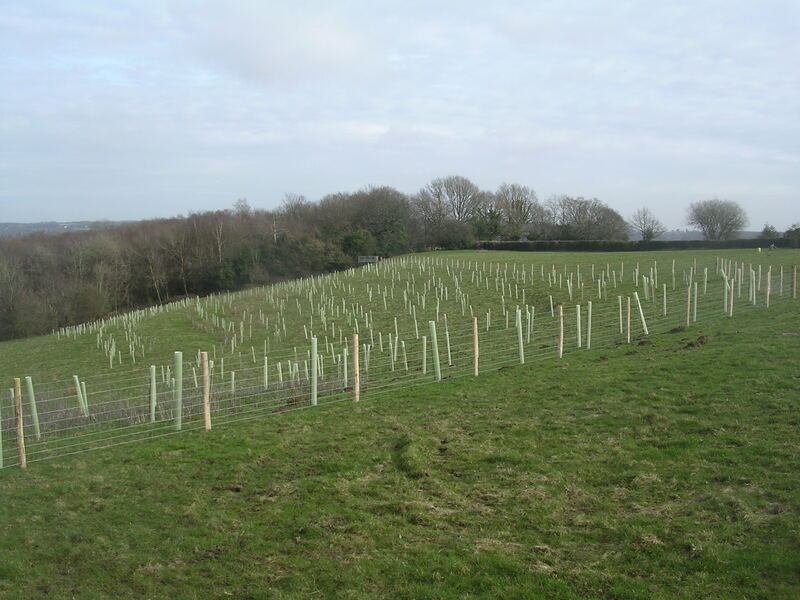 As mentioned before, the excellent people at Woodland Trust subsidised the planting of 900 trees here under their MoreWoods scheme. I promised that I would upload a photo of the planted trees and at last I have got round to it. The trees are a mixture of oak, ash, alder, hornbeam, silver birch, and downy birch and a few crab apple. Plus some which I would call bushes rather than trees: blackthorn, hazel, guelder rose and dog rose. There was a suggestion that I could have hired a petrol-driven auger to dig the holes, but in the end I just used a spade (and a sledge-hammer to put the posts in). I would think that lugging a powered auger around would have made it harder, not easier. The plants were mostly tiny. The ostensible objective is to be self-sufficient in firewood, but I can’t see us getting a crop for 10 years or so. But I also just like the idea of planting, and owning, my own wood. The next thing is to see them through to the point where they are well-established. The two threats, I think, are grazing by deer (which the tubes should prevent) and summer drought in the first year or two. There’s not much I can do about the latter – watering them would not be practical. This entry was posted in Woodland. Bookmark the permalink.